For a Muse of Fire is a magnificent, compelling book about a young woman struggling with mental illness, her identity, and a magic both terrifying and delightful. After the death of her brother in the armée, Jetta supports her family by enchanting their shadow puppets. The puppets, made of wood, glue, and fabric but imbued with the souls of insects and animals, perform the plays without strings or sticks—much to the amazement of the audience. As the fame of the Ros Nai troupe grows, Jetta and her family find themselves invited to the coming of age celebration for the Boy King, who rules their country of Chakrana. The journey to the castle, in neighboring Aquitan, is filled with dangers. Most formidable among them is the armée that brutally cracks down on the old ways and the rebels, who are rumored to be even worse than the armée. Worse yet is that Jetta’s powers are forbidden, old magic of which her mother fears and disapproves, and that no one else will speak of. Jetta must uncover the truth of her identity, save her family, and escape the armée, all while battling her mental illness. A rumor abounds that a certain spring may hold the key to balancing her mind, but Jetta has to get out of Chakrana alive to find it. For a Muse of Fire is simultaneously high fantasy and dark fantasy. It seeks to explore the seedy underbelly of colonialism and the struggles of bipolar disorder inside a lush, vivid world of magic, politics, and necromancy. Jetta’s struggles are numerous and yet her humanity and dogged persistence shine on every page. The bond she shares with her family is especially deep, and brings a warmth and familiarity to otherwise dark and formidable scenes. The magic system is well defined yet in no way burdensome. No charts or backmatter are needed to understand the methodology of necromancy, and yet each time the act of placing a soul in an object is described, it feels fresh. Necromantic history, and Jetta’s place in it, is a delicious sort of evil that is best read slowly, savoring every gory detail. The plot, while mostly journey-based, has enough twists to remain compelling even after the characters and world are established. The inclusion of the Le Perl show hall added unexpected depth and a bit of fun to an otherwise fast-paced and heavy (in a good way) plot. For a Muse of Fire stumbled only with the love interest aspect, which started strong with antagonism and admiration between Jetta and Leo, but too quickly, it seemed, fell into love. As the book is the first in a trilogy, an opportunity was missed to further develop the interplay between these two characters. Although their relationship still has much growing left to do, many of the later scenes in the book between Jetta and Leo felt emotionally rushed. Muse wraps up well as a stand-alone book, yet also provides a salivating cliffhanger. It is impossible to not be swept up into the world, and there is little doubt that the two sequels will be anything less than breathtaking. 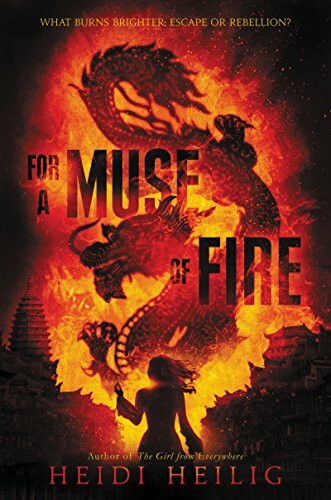 Although aimed at a young adult audience, adult readers will find the pacing and worldbuilding of For a Muse of Fire comparable to adult high fantasy, and thus should feel right at home.